September marks Ovarian Cancer Awareness Month. It is estimated that in the United States, 1.4-2.5% of women will develop the disease. A recent trend in medicine has been aimed at DISEASE PREVENTION, and this holds true for ovarian cancer as well. Is it possible to take preemptive steps to prevent the disease from ever developing in the first place? Prostaglandin E2 (PGE2) is associated with the production of two enzymes, COX-1 and COX-2, both of which are linked with ovarian carcinomas. The theory is that flaxseed, an omega 3 fatty acid and phytoestrogen lignans enriched vegetable source, is associated with interrupting the inflammatory PGE2 pathways which results in decreased levels of COX-1 and COX-2 production. This in turn helps prevent the development of ovarian cancer. A recent controlled experiment with white leghorn hens, an animal that develops ovarian cancer in a similar manner to humans, revealed very promising results. 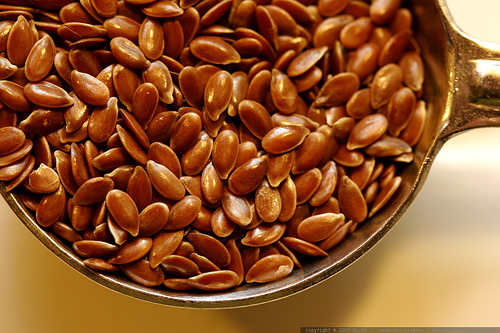 The flaxseed fed experimental group demonstrated a significant reduction in late stage ovarian tumors compared to the control group. Future research with humans is warranted and important. But in the meanwhile, load up on those flaxseeds, because if they benefit us in the same way that they do hens, it may be a step in the right direction for cancer prevention. For some creative and yummy suggestions on how to incorporate flaxseed into your diet, please refer to the link here. Enjoy!